Sorry for the lack of posts the last month. I have been extremely busy. I have tried to post at least twice a week, though my initial goal was once a week. Anyway, Gracie is getting bigger than ever. I bet she’s upwards of eight pounds by now. *Sniffs* I remember the days when she was less than a pound and could fit into the crook of my arm. But those days are over. Gracie continue to be a very feisty and rambunctious little puppy. I took her to a friend’s home, and she exclaimed, “And I thought my yorkie was hyper.” She’s extremely hyper and full of energy . . . all the time. I love how she greets me when I first arrive home. She jumps up and down, up and down. When I finally pick her up, I get tons of face licks and licks anywhere she can place her tongue. It’s a thrill! A few weeks ago, I bought a pet costume at the local Goodwill store. 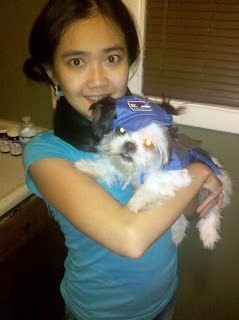 It was a mailman costume, and here is Gracie as a mailman . . . Simply adorable! Even though she now has all her teeth, her chewing has not stopped. She has now started to jump up on tables to chew the corners of my hardcover books. Unfortunately, I’m away during the day so I only see the damage when I get home. 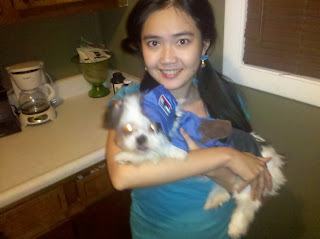 She is a very, very naughty shih tzu puppy! I'm happy to see a new post! Though Gracie sounds like a little terror, she looks adorable in her mailman costume. Your poor books! Does Gracie toss her head around when you walk in the door? It's always cute when they do that.